Every single professional football league in the world shares one commonality and that is the existence of bitter rivalries between certain clubs. Although these rivalries are often shaped by geography and the relative size of the sides involved, other factors such as politics, religion and economics can also play a significant role. In this series we will look at the most heated rivalries around the world, focusing on the origins of the clubs long standing feuds, the players involved and some of their classic encounters. 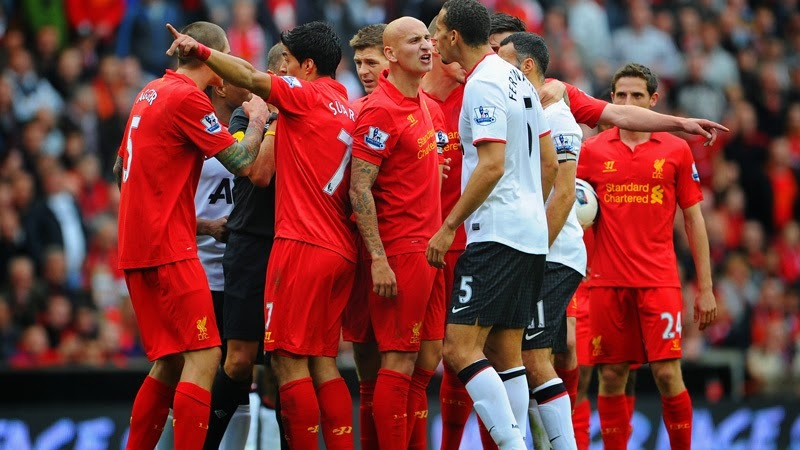 In this week’s edition we’ll look at the English North West Derby between Manchester United FC and Liverpool FC. In the aftermath of Sunday's final day of EPL action, I couldn't help but be struck by the gleeful nature in which Manchester United supporters were celebrating the failure of Liverpool to capture their first title in 24 years. Tweets such as “Chadwick 1 – Gerrard 0” were all the rage on Sunday, as United’s supporters drew attention to the fact that their toothy former fringe player, Luke Chadwick, still had one more Premiership winners medal in his trophy cabinet than Liverpool captain Steven Gerrard. The fact that Manchester United fans were in a sense celebrating a title won by Manchester City should tell you who United fans view as their biggest rivals. When the shoe has been on the other foot, as it was in 1995 when Liverpool fans celebrated with their Blackburn counterparts at Anfield as Rovers beat United to the title, the Liverpool faithful have proven to be very much in the “Anyone But United” camp. Like Liverpool’s 2-0 win over a United at Anfield in April 1992, that virtually assured Leeds United of the title, the red half of Merseyside celebrated as if the title was theirs. To understand the animosity between the two clubs you have to consider the historic rivalry between these two northern cities. During the Industrial Revolution, Liverpool’s ports drove its economy, while Manchester was famous at the time for its booming manufacturing industry. With the opening of the ambitious Manchester Ship Canal in 1894, at the time the largest ship canal in the world, ships could bypass Liverpool and transport goods directly into Manchester. Predictably this resulted in job losses in Liverpool and a deep resentment towards their near neighbours. Coincidently, the two football clubs met for the first time on the 28th of April, 1894 with Liverpool emerging as 2-0 winners over Newton Heath, as Manchester United were named at the time. Matches between the two clubs in the first fifty years of league football were often close affairs, but neither club truly had sustained periods of success during these decades. It was in the post-World War 2 era, that both sides began to emerge as the two major powers in the English game. After the two clubs battled with Leeds United for major domestic honours in the 1960’s, Liverpool then went on to dominate the 1970’s and 1980’s, winning 11 League titles and 4 European Cups during that period. The traditional rivalries between the two clubs and their respective cities also intensified from the 1970’s onwards. With the growing problem of football hooliganism in England, many of the matches between the two sides were marred by incidents of violence between the two sets of supporters. Although their matches today are much more tightly controlled by the police, and therefore the number of violent confrontations have decreased, the two sets of supporters still despise each other. It’s not uncommon to hear disgusting chants about the Munich Air Disaster and the Hillsborough Stadium Disaster at matches between the two sides. The rivalries between the two sets of supporters have been also been fueled by the attitudes of some of the players and managers involved. Former Manchester United manager Sir Alex Ferguson, who led United to 13 League Titles and 2 Champions League wins between 1993 and 2013, said that his “greatest challenge was knocking Liverpool right off their f**king perch”. Current United striker Wayne Rooney has admitted to growing up “hating the Reds”, whereas Steven Gerrard has swapped jerseys with players from all over the world, but has said that he’d never have a United kit in his house. Gerrard’s camera kissing hijinks after scoring against United have also not gone down that well with the Old Trafford faithful. On the other side of the great English Football divide, former United right back, Gary Neville made himself few friends on Merseyside when he kissed his badge and taunted the away fans after a late winner against Liverpool in 2006. Of course no piece on the recent animosity between these two sides is complete without mentioning the Luis Suarez and Patrice Evra incident. After being found guilty of racially abusing Evra during a meeting at Anfield early in the 2011-2012 season, Suarez refused to apologize to the French left back and wouldn’t shake his hand when his Liverpool side came to Old Trafford later in the season. Suarez’s subsequent actions and the misguided support offered to him by former Liverpool manager Kenny Dalglish appeared to have made a tense situation even worse. In another sign of the rivalry between the two clubs, since the 1964 sale of Phil Chisnall from United to Liverpool, no player has been transferred between the two sides. Although a few players, such as Paul Ince, have played for both clubs in their careers there has not been a direct transfer between the two in fifty years. Despite the many differences between the two clubs the one thing they do have in common is a bulging trophy cabinet. Between the two of them they have won 38 League Championships, with 18 for Liverpool and 20 for Manchester United. They have also dominated the domestic cup competitions with 11 FA Cups and 4 League Cups for United, against 7 FA Cups and 8 League Cups for Liverpool. They have also been England’s most successful representatives on the European stage with Liverpool winning 5 European Cups and Manchester United winning 3 of their own. In terms of fans, besides their huge respective local supporters these two giants of the English game have millions of fans around the world and many dedicated fan groups behind them. Both clubs often conduct their pre-season training and matches around the globe, drawing massive numbers wherever they go. Winners of the 1983 FA Cup Final, Manchester United were 15 minutes away from a domestic cup double after a Norman Whiteside 12th minute goal. However, Alan Kennedy struck for the Merseysiders to level the score and then Ronnie Whelan won it for Liverpool with a curling shot in extra time. The League Cup win added to the League Championship that Bob Paisley’s side would later collect in what was his final season with the club. After going ahead 3-0 through goals by Steve Bruce, Ryan Giggs and Denis Irwin in the opening 25 minutes, Manchester United seemed to be in complete control over their bitter rivals at Anfield. However, two goals from Nigel Clough and a goal from Neil Ruddock assured United of what we can only presume was an angry lecture from Fergie after fulltime. Definitely not one for the purists, this tense stalemate meant more to Manchester United in terms of its context in their history. The late winner from Eric Cantona capped a remarkable comeback from the Frenchman, who had been suspended for eight months for attacking a Crystal Palace supporter the season before. It also completed a major domestic league and cup double for a young United side that had been written off at the beginning of the season. In a season where Manchester United went on to win an unprecedented League, FA Cup and Champions League treble, the turning point for many United fans is when the club fought back from a 2nd minute goal by Liverpool’s Michael Owen, with two goals at the death by Dwight Yorke and Ole Gunnar Solskjaer.